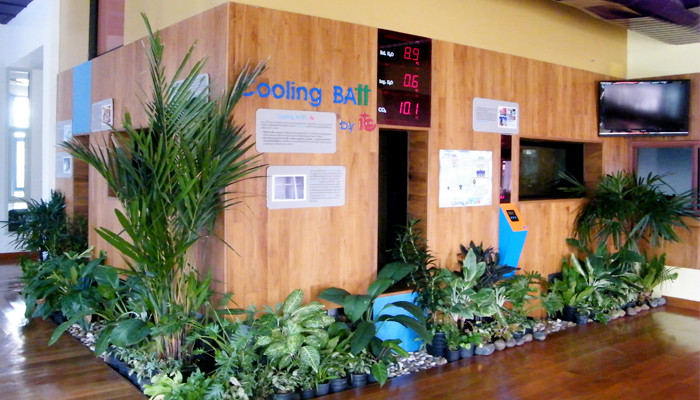 Newest innovation, CO₂ thermal ice storage system, design to utilize Carbon Dioxide (CO₂) which is GWP base line as a main refrigerant for the air conditioning system in conjunction with other refrigerants and combined with the latent heat storage technology of Cooling BAtt, which generates cooling in night-time and stored cooling energy be used in daytime. This technology with total system design C.O.P. can help to reduce electricity consumption, save electricity pay bill and high environmental friendliness. Many people may wonder what makes it so economical. The simple answer is ITC’s Ice Bank is highly specialized equipment designed for generating tons of ice clinging along the coil in the night-time that surround is cold enough to decrease condensing temperature, this will lower energy and power consumed by compressor which is the highest energy consumption in refrigeration cycle and also lower the heat rejected quantity. You can save more by run only the water pump or less set of evaporative condenser since the temperature of air and circulate water flows through the evaporative condenser is lower than daytime.